Wow! This overhead shoulder press from the rack is unreal! 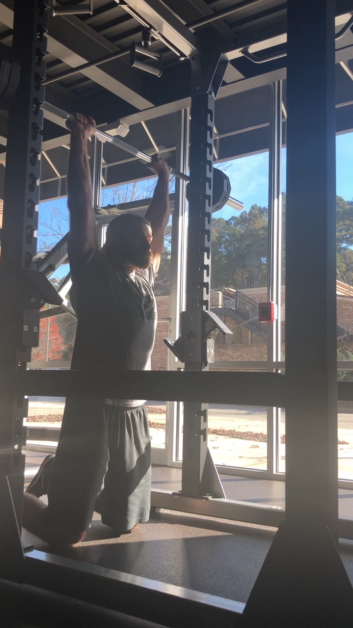 Go ahead and call it the tall kneeling rack shoulder press. Long name, but it’s so worth it to try. The tall kneeling forces you to engage your glutes and abdominal muscles which means an improved overhead position. How to perform: squeeze your glutes and core, drive the bar into the rack, and press overhead with a range of motion your body allows. Don’t: force unnecessary range of motion, and flare your rib cage which will put tension on your lower back. Depending on your goals keep the reps between 6-12. Keep the reps lower if your goal is strength and higher if your goal is hypertrophy. In need of a trainer to help take your upper body muscle to the next level? Email us at trainers@forge-rx.com for a consult or call to discuss your goals and how we can help.